Calvin "The Beast" Abueva, Ronald Pascual and Ian Sangalang, they are known as the "Big 3 of Baste", but I prefer to call them "The 3 Kings of San Sebastian" because just like King James (LeBron James) they are also MVP type of players. They are the leading scorers in the NCAA Season 87. Take a look at the current NCAA scoring rankings and you'll see the 3 kings of San Sebastian figuring at the top 3 spots. Calvin is leading the way with a total of 92 points. Ronald Pascual placed 2nd behind Abueva with 90 total points. And figuring on the third spot is Ian Sangalang, the big lefty, with 89 points. That's how good the 3 kings of San Sebastian are. They managed to take the top 3 spots. How often do we see such a dominating group of guys like them in a league like NCAA? Very rare right? They appear once in a blue moon. The rest of the 4th to 10th spots in the scoring rankings belong to Vergel Zulueta of Arellano, Carlo Lastimosa of CSB, Jan Jamon of EAC, Allan Mangahas of Mapua, Rocky Acidre of Arellano, Chris Cayabyab of Lyceum and John Lopez of JRU respectively. 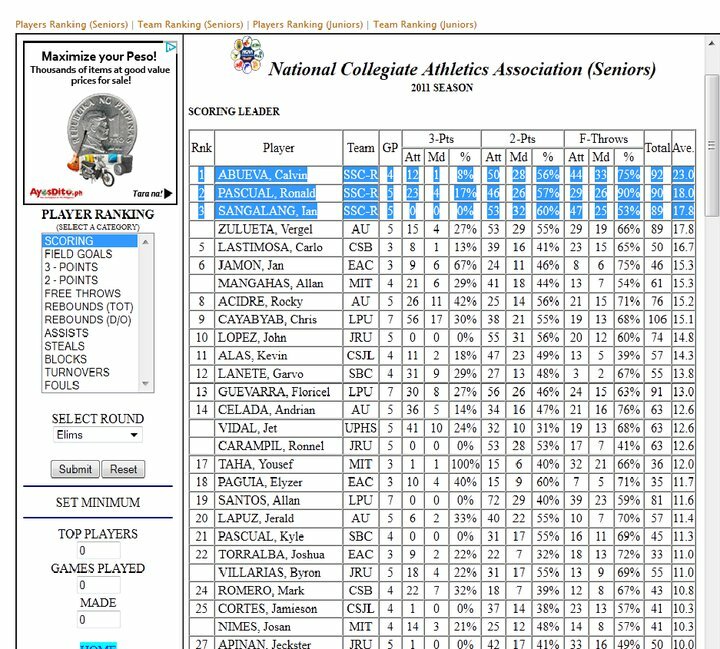 The thing that surprised me is that not a single player from the defending champions San Beda Red Lions is included in the top 10 scorers of the current NCAA. I guess they haven't found a replacement for the Superman Sudan Daniel. If Daniel is active for the Red Lions right now, I believe he will be included in the Top 10. I also think that San Beda is banking on their well balanced scoring. They are not after individual accolades or individual awards, they want to highlight their team-work. But then again, the season is still young. Who knows, Kyle Pascual or Garvo Lanete might barge in the Top 10 scorers list next week.